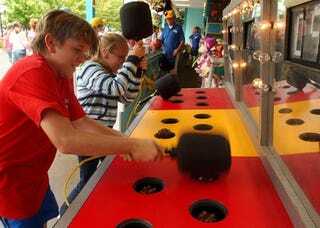 The popular game Whac-A-Mole was invented in the early 1970s as a carnival game by a young man who didn't originally understand how valuable his invention was. He didn't secure a patent and lost the invention. The young man ended up forming Showbiz Pizza Place, which bought more Whac-A-Moles than anyone else. Though it took a while for Fechter to feel the gratification of his success, anyone playing the game gets instant satisfaction from whacking moles. You wouldn't think much would happen instantly with the John Deere tractors we showed today, but Sloop John B found it cathartic. Ah yes, #11 brings back memories of my old College job. You would think cutting acres of grass with a pull behind deck mower on an Old John Deere would get old. But no, it's actually quite cathartic. The rhythmic chug of the diesel, the hum of the mower and the smell of the grass and diesel just release all of your pent up stress. Scope creep only happened when it poured in conjunction with a heavy fertilizer, but I could always confirm success of my job by looking behind me. Man, I miss that instant gratification.